Disclaimer: This page is no longer being updated. It contains incomplete/inaccurate data/information, and there are numerous broken links. Consulting the trail organizations listed in the segments below (or a search) should yield up to date information for each. For the two major roadwalks, from Key West to Loop Road, and from the Conecuh National Forest to Flagg Mountain, consult the Florida Trail Association and the Alabama Hiking Trail Society respectively. The ECT is a continuous footpath (almost), which crosses sixteen states and three Canadian Provinces. (See related articles located at Backpacker, Maine Today and GORP) It encompasses (for all intent and purposes) the entire breadth of the eastern North American continent, from the Gulf of Mexico, at the southernmost point in Key West, Florida, to the Gulf of St. Lawrence, where the Appalachian Mountains plunge dramatically to the sea at the spectacular Cliffs of Forillon, Cap Gaspé, Québec. Recently, the 500+ miles of the Long Range Appalachian Mountains of Newfoundland have been added, and the Newfoundland chapter of the International Appalachian Trail (great folks) has recently organized, and all are working diligently to get that part of the trail up and running. The ECT was created by combining seven separate and independent sections, beginning with a roadwalk in Key West, and ending at the northern terminus of le Sentier International des Appalaches/International Appalachian Trail, Belle Isle, Newfoundland, a distance of some 5,400 miles. Please click on the ECT map for a larger "printer friendly" map of the Eastern Continental Trail, containing trail names and mileage information. The KER begins at the monument marking the southernmost point on the eastern North American continent, in Key West, Florida. From there, the roadwalk continues north on US1 to Florida City/Homestead. There it picks up Krome Avenue (SR997) and proceeds north to Tamiami Trail (US41/SR90). At that intersection the roadwalk turns west to follow Tamiami Trail to the Miccosukee Indian Reservation at Loop Road, then follows Loop Road to the southern terminus of the Florida National Scenic Trail on Loop Road. This KER route, with associated mileage, is detailed in the The Florida Trail Guide – Logistics for hiking and backpacking the Florida Trail. Additionally, consult Pinky's site, the DeLORME Atlas and Gazetteer for Florida, and the Interactive Maps of the Florida Keys. Development of the FT began with a dream by a man named Jim Kern. Jim and other volunteers organized the Florida Trail Association nearly forty years ago. Bordered by rivers and lakes and surrounded by forests of palm, pine, cypress and moss-draped live oak, the trail offers a unique hiking experience. Utilizing public lands where possible, and developed under agreements with private landowners elsewhere, the FT threads its way north, then west through the state. The winter and spring months, when the air is crisp, and the dry season is upon the land, are best for hiking in Florida. In the South, just an hour (by vehicle) west of Miami, the FT begins its northerly journey, in the Big Cypress National Preserve, (Everglades National Park), a semi-tropical ecosystem featuring varieties of cypress draped with orchids and bromeliads. Central Florida terrain boasts rolling pinelands, palm and oak hammocks, and many lakes. North Florida is known for its rivers, springs, deep woods, and its unsurpassed scenery and solitude. Deer, turkey, and migrating birds, as well as an incredible diversity of other wildlife are abundant in the many wilderness areas through which the FT passes. The ECT currently utilizes over 1100 miles of the 1800 miles of treadway that is the FT, beginning in the Everglades and ending clear out in another time zone in the Florida Panhandle. View the most current Florida Trail Association information concerning the ECT. The longest connector link along the entire ECT runs for some 190 miles through southern Alabama, involving a roadwalk along mostly rural, scenic, country roads ─ a land of gentle, friendly people. It starts at the Florida/Alabama line in the Conecuh National Forest, where the FT connector ends and forest service roads begin. North of Montgomery, the roadwalk will soon end, where the Pinhoti National Recreation Trail begins atop Flagg Mountain. This roadwalk through southern Alabama is an absolute trailtown lovers delight! Check under Notices to Thru-Hikers, or under Notice to Long Distance Hikers, for a guide to the route currently recommended by the Alabama Hiking Trail Society. For the USFS Conecuh National Forest map, go to the Forest Place Store. In 2007, to promote and advance the PT (path of the turkey), the Pinhoti National Recreation Trail Alliance (PTA) was organized, a not-for-profit, non-chartered cooperative of many volunteer organizations (trail/other), and numerous local, state, and federal agencies. The PTA serves as a clearinghouse for all vital information concerning the PT. In Alabama, the PT lies almost entirely with the Talladega National Forest. Beginning on Flagg Mountain, south of Sylacauga, the southernmost of the grand Appalachian Mountains to stand above 1,000 feet, the PT trends generally northeast along a continuous footpath, some 140 miles, to Flagpole Mountain (where presents a most spectacular vantage across and into Georgia) at the Alabama/Georgia line (time change at the cairn, central to eastern). Of significance: The beautifully restored old stone CCC Lookout Tower atop Flagg Mountain stands ever as a sentinel, marking the symbolic beginning/terminus of the Appalachian Mountain Range - at least as we know these timeless and spiritual mountains to exist on the North American continent. In Georgia, the PT descends Flagpole Mountain to enter the delightful, hiker-friendly trailtown of Cave Spring. From there, it continues trending generally northeast some 155 miles, as it traverses the Armuchee Ridges west of Rome - then on to Rocky Face near Dalton, there to cross the Great Valley, to reach the rugged Cohuttas before connecting to the Benton MacKaye Trail below Dyer Gap. Oh yes it is true, that south of Springer Mountain, seldom do these grand old Appalachians rise to stand much above 2,000 feet - but do not be lulled or turned away! For within the bosom of these little-known southern mountain reaches, does this grand PT traverse some of the most rugged, remote, breathtakingly picturesque mountain terrain to be found anywhere along the entire Appalachian Mountain Range - from Flagg Mountain, Alabama, clear to Belle Isle, Newfoundland. Believe me, dear friends, I know! For information concerning the PT, visit the PTA. Also, for PT resources go to the Alabama Hiking Trail Society, the Georgia Pinhoti Trail Association and the USFS. A portion of the BMT in Georgia connects the PT to the Appalachian National Scenic Trail at Springer Mountain. Thus, for some 65 miles the ECT follows the BMT. This treadway is complete and is well maintained, through the cooperative effort of the USFS and the Benton MacKaye Trail Association. The BMT is moderate to strenuous hiking, preparing hikers for what lies ahead on the Appalachian National Scenic Trail. The AT, the granddaddy of all trails, begins on Springer Mountain, Georgia, and runs some 2150 miles along an uninterrupted footpath, over mountains and through the valleys in fourteen states, to Mt. Katahdin, Maine. The AT is the backbone for a network of other delightful and enjoyable side and loop trails all along the central Appalachians. It serves as the anchor and the grand section for the ECT. The AT is maintained by the Appalachian Trail Conservancy (ATC) through the cooperative effort of the ATC, its maintaining clubs, and a myriad of local, regional, and federal agencies. The SIA/IAT offers hikers the opportunity to continue their hike along the Appalachian Range from Baxter State Park, Maine to where the Appalachians meet the sea at Cap Gaspé, Québec, thence across the Gulf of St. Lawrence, to continue along the spectacular Long Range Appalachian Mountains of Newfoundland. The SIA/IAT connects Mt. Katahdin, Mt. Carleton, Mt. Jacques Cartier, and Lewis Hill, the highest points in Maine, New Brunswick, southern Québec, and the island of Newfoundland respectively, to end on the remote island of Belle Isle, Newfoundland. Interest in the entire Appalachian Range, as we know it to exist on the North American continent, and especially the interest to hike there, is now taking root in Newfoundland, through formation of the newest group of trail builders, the Newfoundland Chapter, SIA/IAT. These sections, beginning with the Pinhoti Trail on Flagg Mountain in Alabama, combine to create the Appalachian Mountains Trail. The AMT stretches from where the Appalachians begin in south-central Alabama to where they plunge to the sea at the tip of Belle Isle, Newfoundland, in the Labrador Sea. †John Brinda first hiked this amalgam of trails in 1997, which has since come to be known as the Eastern Continental Trail. The following year, Eb Nimblewill Nomad Eberhart retraced Brinda’s path. Shortly thereafter, Nomad coined the term Eastern Continental Trail, in order to offer up some identity to their remarkable and respective adventures. 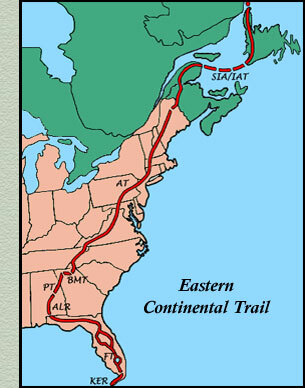 In 2000-2001, Nomad returned to Canada, again, to hike the ECT from north to south. 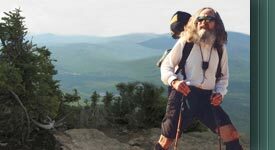 Shortly after completing that southbound trek, he returned north once more, to Canada, to hike the Long Range Appalachian Mountains of Newfoundland ─ and shortly thereafter, to chronicle the first known hike o’er the entire Appalachian Mountain Range, at least as we know these spiritual, aged mountains to exists on the North American continent. Where Less the Path is Worn, the latest book by Nomad (which follows this remarkable adventure), is now out of print and no longer available at this site. Please check our Book/Intro page for availability on the used book/secondary market. Also, the ATC Trail Store may have a few remaining copies in their inventory.